How will Sláintecare be implemented? Sláintecare will have its own leadership and its own team to make sure we reach our health goals and meet our targets. The Sláintecare Implementation Strategy explains the governance and accountability arrangements that will be in place to make this reform a success. The figure above gives an overview of these implementation structures. The High Level Delivery Board is made up of Secretaries General of the Departments of Health, Department of the Taoiseach and the Department of Public Expenditure and Reform, the CEO of the HSE and the Sláintecare Executive Director. It will ensure the effective delivery of agreed plans and resourcing of the Sláintecare reform programme. The Sláintecare Programme Office, based in the Department of Health and led by an Executive Director, is the central hub of the reform programme, driving reform through implementation planning, monitoring and engaging with stakeholders across the health system. The Advisory Council, made up of stakeholders including clinicians, patient representatives, and international experts, will provide expert advice, and support to the Sláintecare Programme Office throughout the reform programme. The Sláintecare Executives Task Force is chaired by the Executive Director of the Sláintecare Programme Office and made up of senior managers from the Department of Health and the HSE, to ensure a coordinated, integrated and effective approach to the programme. An Taoiseach and Minister Harris recently announced Executive Director of Sláintecare Programme Office and Chair of Advisory Council to lead health reform . 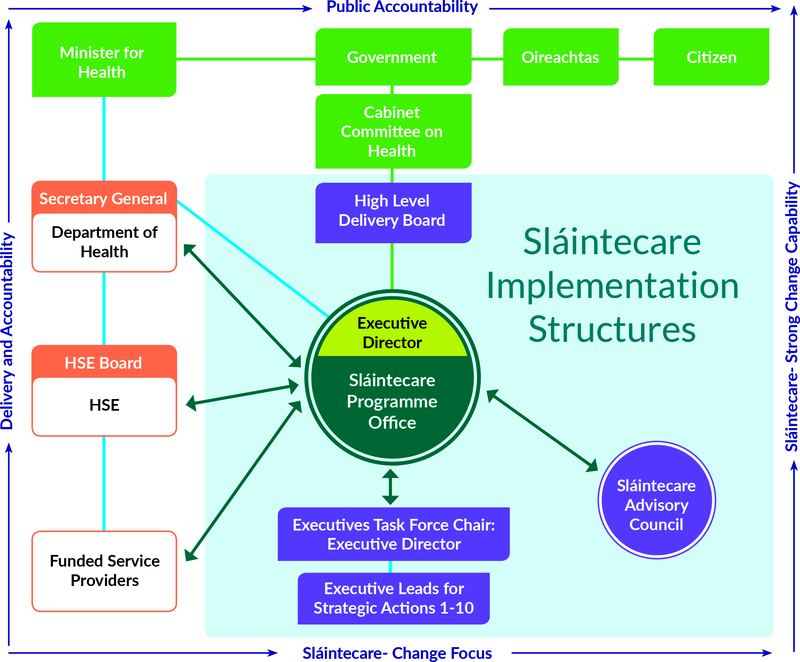 For more details on the implementation structures please see the Sláintecare Implementation Strategy.